Switch up taco night with this Mexican-style black bean soup! It’s packed with flavor and cancer-fighting nutrients, such as tomatoes, bell peppers , onion and garlic, sweet potatoes, and black beans. Wash and chop the veggies. Sauté the garlic and the onion in 1-2 tablespoons of water. Add in the sweet potato. Continue to sauté until the sweet potatoes start to soften. Add in the zucchini and cauliflower and continue to sauté. Add a tablespoon of water, as needed throughout the cooking process to keep the veggies from sticking. Finally, add in the tomatoes, cumin, and cayenne pepper. 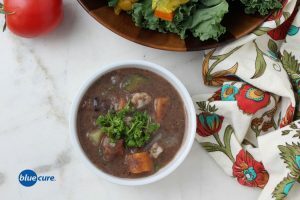 In a blender, combine 1.5 cups of the cooked black beans with 3-4 cups water, the miso, and 2 cups of the cooked veggies. Blend until smooth. (Depending on the size of your blender, this may need to be done in shifts). Pour the puree into a pot and add in the rest of the cooked vegetables. Add more water as desired for thinning the soup. Heat on medium until the soup reaches desired temperature. Serve with fresh herbs or chopped greens and a side salad. Optional to top with diced avocado. Enjoy!